https://sep.yimg.com/ay/yhst-33477391359232/goldflake-angelfish-apolemichthys-xanthopunctatus-goldflake-angel-fish-6.jpgGoldflake Angelfish - Apolemichthys xanthopunctatus - Goldflake Angel Fish Expert Only!!! Not Cover Under Arrive GuaranteedSemi-aggressive100 Gallon7.9 inchesYes, with CautionOmnivore, Greens, Pellet, FlakePacificPomacanthidaeSmall 2" - 3"
The Goldflake Angelfish, also known as the Gold-spangled or Gold-spotted Angelfish, displays beautiful gold spots throughout the body. The mouth region of this angel is brightly colored in blue or purple. The fins, which are black in color, are bordered by a striking blue. Juveniles have a large dark spot below the caudal portion of the dorsal fin. A single Goldflake Angelfish will do well in a tank of at least 100 gallons with plenty of hiding places. Once established, the Goldflake Angelfish may become territorial. This Angelfish is one of the safer choices of the large Angels for the reef aquarium, and has proven not to pick on sessile invertebrates. The Goldflake Angelfish was once very rare to the hobby, but has recently become more available. Little is known about the reproductive behaviors of this fish. Behavior: The Goldflake Angel may act aggressively toward other fish. However it is a good candidate to mix with other large Angels. Size: Goldflake Angelfish grows upto 8 � 9 inches. small 2 to 3; inches; medium 3 to 4; inches; large 5 to 7 inches; XL 7 to 10 inches. Minimum Tank Size Suggested: The Goldflake Angel prefers a tank of at least 100 gallons with plenty of places to hide & swim. 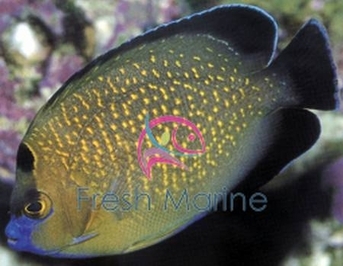 Habitat: Goldflake Angelfish are found near Christmas Island, central pacific. Diet: The Goldflake angelfish is a omnivore and likes to eat marine algae, mysid shrimp, Spirulina, sponges, and other meaty treats. Like all large angels, the Goldflake will require feeding with live sponges or a sponge based prepared food like Ocean Nutrition Angel Formula cubes.